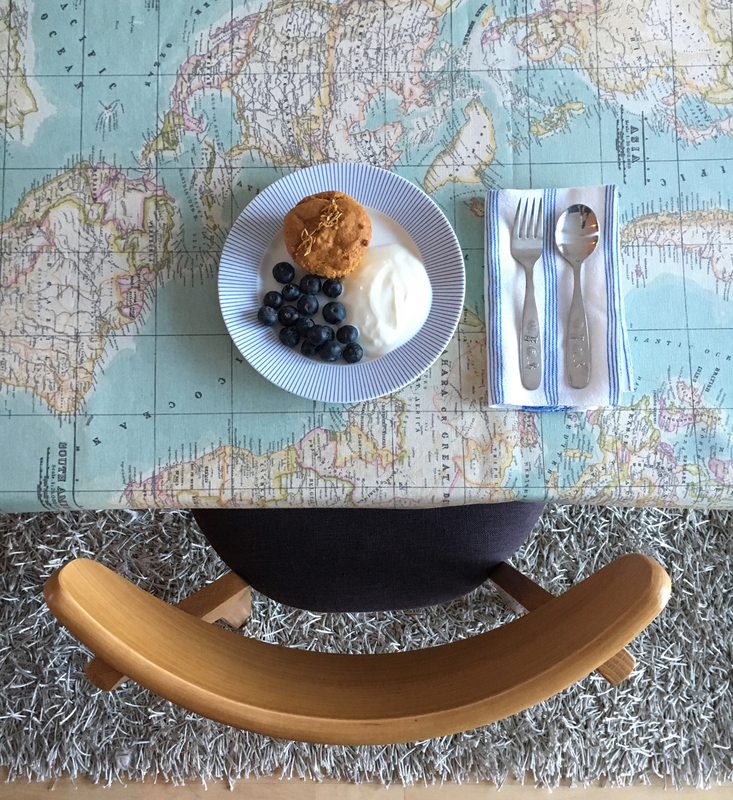 We are big fans of making time in the morning to fill ourselves with a nourishing breakfast. I just feel it sets us up for the day. I’m also keen on getting some veg into the girls straight away and I do this usually by serving a delicious green smoothie or a yummy muffin. 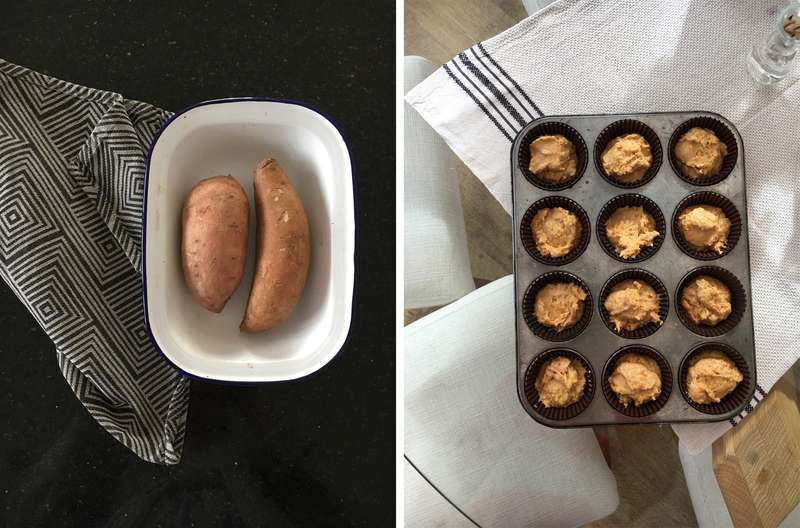 We are currently loving these sweet potato and Chinese five-spice muffins and make a batch on a weekly basis. 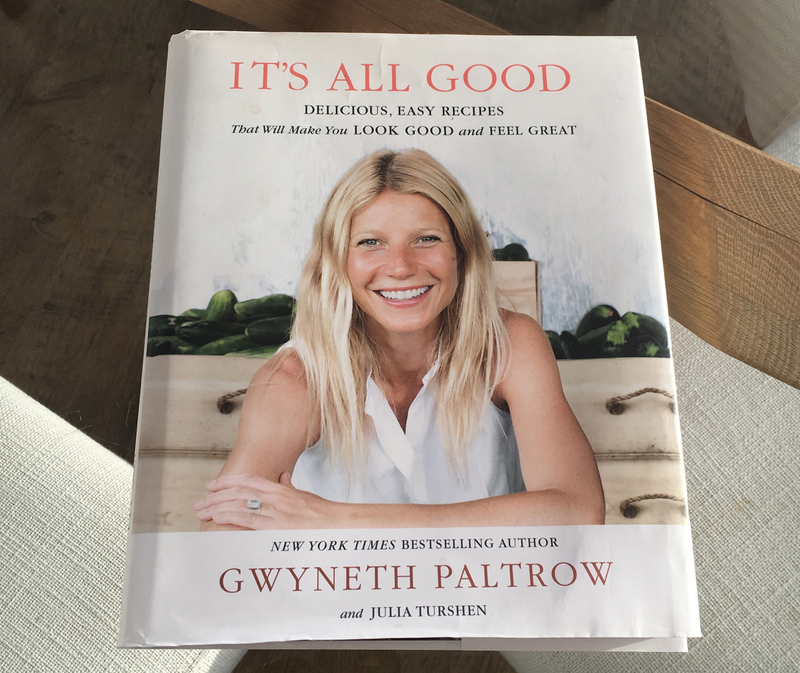 Inspired by Gwyneth Paltrow’s It’s All Good cookbook, I slightly tweeked the recipe so it would work for us and made them extra special by sprinkling dried marigolds over them. I do love eating dried flowers and always try to incorporate them into my cooking. The girls equally love them as they make food just look so pretty. The gentle peppery flavour of the marigolds works really well with the sweet potato flavour. Fortunately, my girls eat pretty much everything so I don’t need to disguise vegetables to get them to eat them but for those who do have a fussy eater in the family and struggle to get vegetables into their children, these are so good and so so tasty! Kids will never guess they were made from sweet potatoes. Preheat the oven to 180 degree C. Prick the sweet potatoes a few times with a fork and bake in the oven until soft (about 1 hour). Set the sweet potato aside until it’s completely cool. Peel the sweet potato, discard the skin, and mash the flesh in a mixing bowl with a fork. Whisk the oilve oil, almond milk, maple syrup and vanilla into the sweet potato. In a separate bowl, whisk together the flour, baking powder, baking soda, five-spice powder and salt. Fold in the dry ingredients into the wet ingredients. Line a 12-cup muffin tin with paper liners and evenly distribute the muffin batter among the cups. Bake for 20-25 minutes. Half way through the baking time, brush each muffin with a little extra maple syrup and sprinkle over some dried marigolds. Allow the muffins to cook before serving. 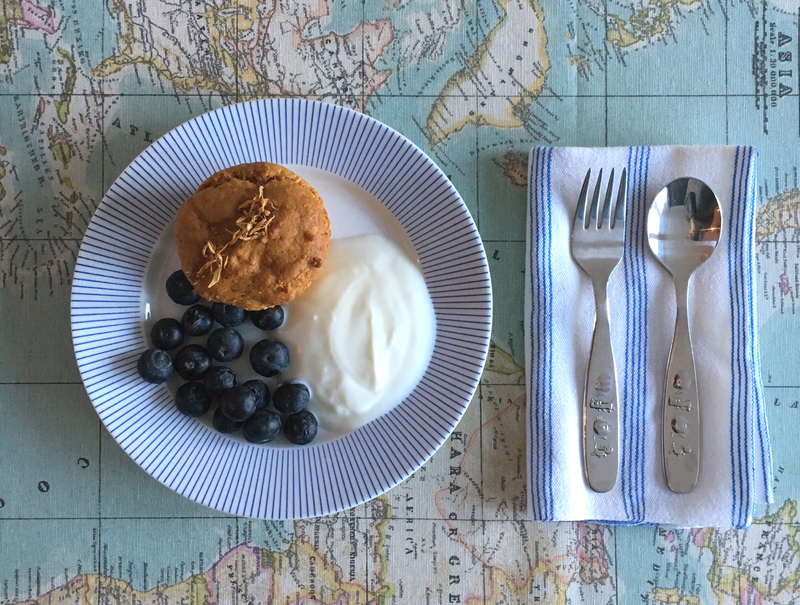 We love ours for breakfast served with some delicious organic yoghurt and a handful of blueberries. Such a satisfying start to the morning! 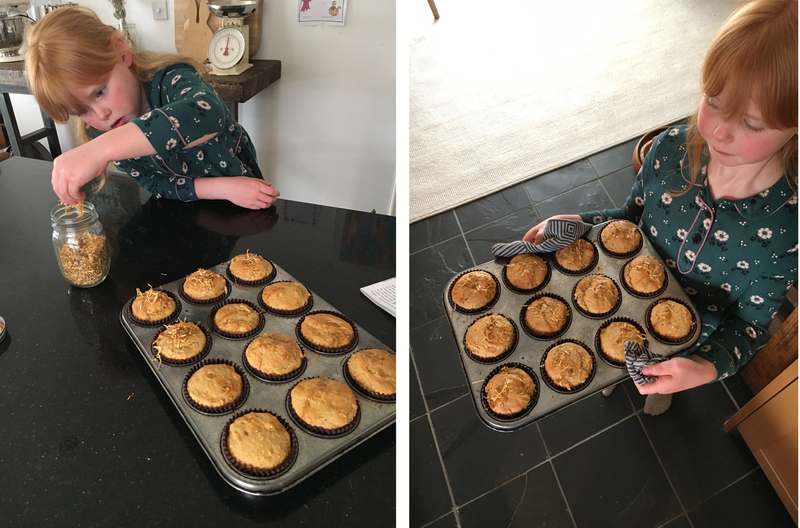 I’ve served these muffins before on a large platter for a play date together with berries and they went down a treat. For the mamas too! If you love cooking with your children and need some recipe inspiration check out my food blog, Wild Flours! The muffins sound yummy but may I ask where is that amazing tablecloth from? Great recipe but absolutely love the tablecloth. Where can one buy it? Thanks, the muffins are super delicious! I bought the oil cloth a few years back online from John Lewis.